Jennifer Weston works for the Mashpee Wampanoag Tribe. 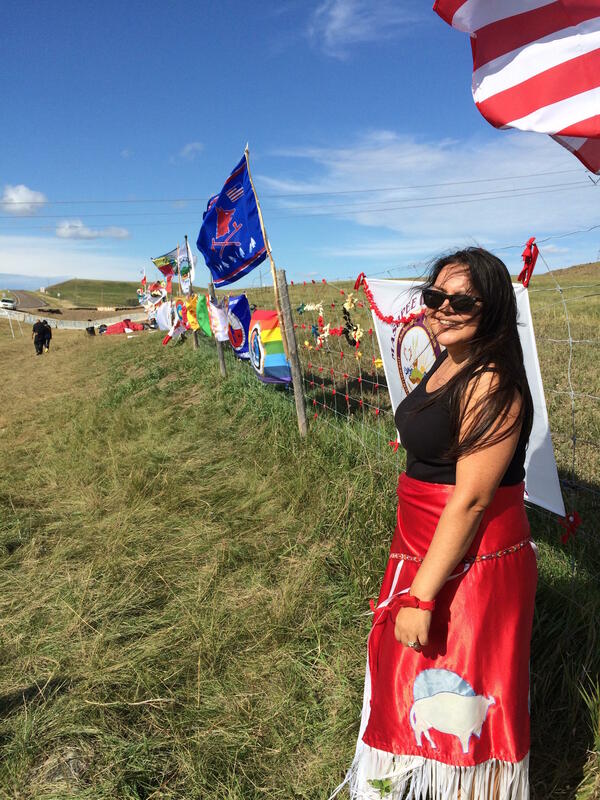 She is a citizen of the Standing Rock Sioux Tribe and took part in the protest camp. Since August, several thousand Native Americans have been camping in the path of a proposed oil pipeline in North Dakota. They are concerned that the Dakota Access pipeline will threaten their drinking water and their sacred sites. It is the single largest protest by Native Americans in more than 100 years. Earlier this month, President Obama temporarily halted construction on the pipeline for the section near the Standing Rock reservation, though the company is allowed to build other parts of the project. The protesters say they are staying put. Energy Transfer Partners, LP, the pipeline builder, did not return a request for comment from WCAI. Jennifer Weston is the language department director for the Mashpee Wampanoag Tribe and a citizen of the Standing Rock Sioux tribe of North and South Dakota. She attended the protest at the end of August and is now back on Cape Cod. Jennifer Weston is a citizen of the Standing Rock Sioux Tribe. She works for the Mashpee Wampanoag Tribe. She says the camp is a place of peace and prayer. The people camping are single-minded about protecting the land from what they see as a serious threat, she says. And they've set up rules to avoid problems. "Everyone who comes through the camp gates is reminded that no weapons of any kind are allowed, and no drugs or alcohol," she said, adding that some people have been escorted out of the camp for violating those rules. "People are very serious about remaining in peaceful solidarity," she said. Weston says the original plan was to locate the pipeline near the drinking water supply for Bismark, North Dakota, but the Army Corps of Engineers denied the application because it was too risky. "So our feeling is that if the pipeline is not safe enough to be located next to the capital city's drinking water, then it's certainly not safe enough to be located next to our reservoir for an entire reservation population," she said. Weston says the fact that so many Native Americans have all gathered in one place is significant. "I don't think we've ever seen anything like this gathering before," she said, adding that about 250 tribal nations have sent formal or informal delegations to the camp.